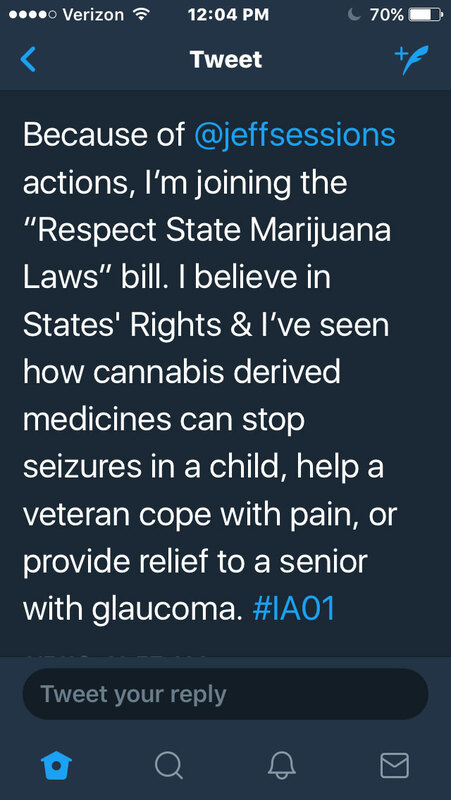 Republican Congressman Rod Blum of Dubuque announced today he is co-sponsoring a bill to prevent federal prosecution of marijuana users and businesses in states like that have legalized marijuana. 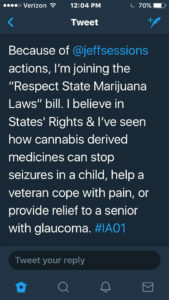 It is called the “Respect State Marijuana Laws Act.” It was first introduced in congress last February. Congressman Blum’s decision to be a co-sponsor now comes after this week’s announcement from U.S. Attorney General Jeff Sessions. Sessions has said U.S. attorneys may start prosecuting marijuana cases in states where pot has been legalized. Some Iowans with chronic epilepsy have state-issued cards which shield them from state prosecution if they’re caught posessing cannabis oil. A state law also has set up a system in Iowa for growing, manufacturing and dispensing cannabis oil for a range of health conditions by December 1. Under federal law, cannabis oil is considered an illegal form of marijuana.